Day's first singing performances were on local radio programs. She also sang with bandleader Barney Rapp and his group for a time. Rapp encouraged her to adopt a stage name, and she changed her last name to Day after the song "Day After Day." In 1940, Day landed a spot as a vocalist with the band led by Bob Crosby-brother of crooner Bing Crosby and a successful bandleader in his own right. But later that year, she teamed up with Les Brown and his group. With Brown, Day scored her first number one hits, "Sentimental Journey" and "My Dreams Are Getting Better All the Time," in 1944. Her work with Brown made her a popular singing sensation during World War II. Day, in her songs, seemed to be accessible and personable to her audience. After parting ways with Brown in 1946, she soon made the transition from the concert stage to the big screen. Even during her acting career, Day found time for music projects as a solo artist. She scored another hit in 1948 with "Love Somebody," a duet with Buddy Clark. In the 1950s, Day reached the charts with such songs as "My Love and Devotion" (1952) and "Let's Walk That-A-Way" (1953) in addition to her many movie-soundtrack hits. She had her last non-film-based hit in 1958 with "Everybody Loves a Lover." Albert Gordon MacRae was born on March 12, 1921, in East Orange, NJ. During his early years, he resided in Syracuse, NY, and, while in high school, spent much of his time singing and acting in the Drama Club. It was also during this time that he learned to play the piano, clarinet and the saxophone. At 19, he entered a singing contest and won a two-week engagement at The World's Fair in New York, performing with the Harry James and Les Brown bands. In 1940, while working in New York City as a page, he was "discovered" and hired to sing for the Horace Heidt Band. After a two-year stint, he joined the Army Air Corps and worked as a navigator for the next two years. He made his Broadway debut in a show called "Junior Miss", as a replacement in the role of "Tommy Arbuckle". Next, he appeared, again on Broadway, in Ray Bolger's 1946 revue, "Three To Make Ready". It was here that he was spotted by Capitol Records and signed to a long-term recording contract in 1947. He stayed with the label for more than 20 years. In October 1948, on ABC, he starred on the radio show "The Railroad Hour". The show moved to NBC in October 1949 and continued until June of 1954. It presented operettas and musical dramatizations, all starring Gordon and many different leading ladies. Also in 1948, he was signed to a seven-year contract with Warner Brothers Pictures and, soon after, made his film debut in the non-musical, The Big Punch (1948), opposite Lois Maxwell (well-known later as "Miss Moneypenny" in the James Bond films). 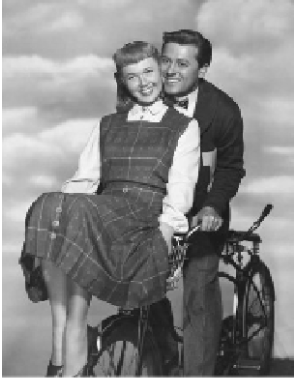 What followed was a string of hit musicals, starting with Look for the Silver Lining (1949), in which MacRae had a featured role opposite June Haver and Ray Bolger, and five fondly remembered films with Doris Day, beginning with Tea for Two (1950). Perhaps his two best and well-known films were two of his last: Oklahoma! (1955) and Carousel (1956), both written by Richard Rodgers and Oscar Hammerstein II and both opposite screen newcomer Shirley Jones. MacRae began to suffer, in the late 1950s and early 1960s, from bouts of heavy drinking and, by his own admission, developed into an alcoholic. He revealed that he had been "picked up for drunk driving" during the filming of "Carousel". He conquered the disease in the 1970s and went on to counsel other alcoholics. He continued recording and performing on dozens of television shows. He and his wife, Sheila MacRae, appeared together frequently and even released an album together. His daughters, Meredith MacRae and Heather MacRae, acted in films and on TV. On September 22, 1974, he appeared as a sheriff on an episode of McCloud (1970), starring Dennis Weaver, entitled "The Barefoot Girls of Bleeker Street". His final film came in 1979, a fine dramatic role in The Pilot (1980), which starred Cliff Robertson. He suffered a stroke in 1982. He continued on with the support of his second wife, Elizabeth, and his five children. This brilliant performer continued to tour, when his health would permit, allowing audiences to relive some of his biggest film hits. On January 24, 1986, Gordon MacRae died at the age of 64, at his home in Lincoln, NE, of pneumonia, the result of complications from cancer of the mouth and jaw.